Electronic invoicing (e-invoicing) is a low-cost transaction processing system that leverages information technology to transform a manual and paper-oriented billing process into a faster and more efficient electronic version of data messaging and record keeping. A definition of e-invoicing is provided in the EU Council Directive 2001/115/EC : "The sending of invoices 'by electronic means', i.e. transmission to the receiver using electronic equipment for processing and storage of data". With e-invoicing the traditional paper invoice is replaced by an electronic version, which removes many of its disadvantages whilst maintaining the invoice as an intact document. The idea of electronic invoices stems from the increasing focus on paperless trading, loosely defined as business transactions that involve exchange of data through electronic means. It requires all participants in the trading activity to realize and implement a standard process of exchanging and accepting contracts or bills documenting transactions. Depending upon the nature of the transaction, the process of paperless trading can involve a number of agents such as insurers, transport organizations, excise and Customs departments, banks, and financial organizations. Government authorities (e.g., clearing, customers, excise, tax departments) play an important role in this chain. Therefore, to facilitate greater efficiency among all participants, these public departments must set certain standards regarding components and formats of electronic bills/invoices, their transmission processes, and their legal status. From a logistical perspective, electronic invoices help to reduce the amount of paper used for documenting and storing transaction information. Through e-invoicing sellers can dispense with a number of manual processes such as printing, mailing, documenting, storing and reconciling paper invoices. The adoption of electronic invoicing standards offers faster and more efficient data transfer, thus reducing the duration of billing cycles. Timely notifications and updates on invoice status, faster transmission of invoices for payers' approval, and quicker dispute management systems produce better customer service. Payers get regular updates on invoice status and payment timings, which enable them to estimate cash outflow with higher certainty, thereby helping them achieve better and more efficient working capital management. The evolution of hosted and Software-as-a-Service (SaaS)models has significantly lowered the upfront cost of implementing automated solutions and reduced the hassle of maintaining them. Early payment discounting and supply chain finance capabilities offered by e-invoice networks are delivering tremendous strategic benefits around working capital improvements. The intrinsic values connected with the adoption of e-invoicing are encouraging many countries to apply such methods, especially on behalf of domestic small and medium enterprises. One the biggest barriers still hindering electronic invoicing and payments initiatives is supplier adoption, or lack thereof. Persuading suppliers to change their processes to align with buyer's needs is a costly and time-consuming process. Success depends largely on the buyers' ability to present a compelling value-adding proposition to suppliers. Many buyers have failed to effectively communicate the value of invoice automation to their suppliers and, as a result, have struggled to generate the results they expected from implementing e-invoicing solutions. One of the key messages of the value created by electronic invoicing is that it represents the supporting element of supply chain finance. 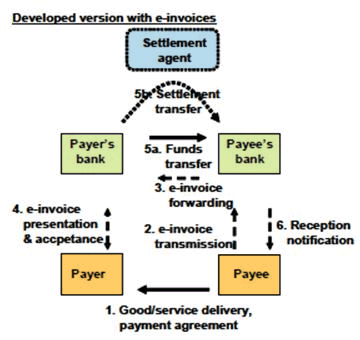 Useful reading includes the European market description and analysis for e-Invoicing of the Euro Banking Association (EBA)-Innopay (2008) and a research on e-Invoicing from the Deutsche Bank.